I picked up a pair of quinces at the Tumut Festival of the Falling Leaf. It seemed poignant, to buy such seasonal produce at a festival to celebrate autumn. I wanted to slow roast them with pork and a few warming spices. Ginger and black pepper would do the trick. I was stoked when Boxgum Grazing had some pork belly for sale on Saturday. I was sold. This is a very simple recipe that I made in two parts. First, place the quinces and other ingredients in a slow cooker, then tuck the pork belly on top, keeping the skin dry, and cook it overnight. You can do this step well in advance. When you want to eat the pork, heat it in a hot oven and finish the crackling under the grill! Sensational! Peel, core and slice the quinces. Place in a slow cooker with the grated ginger, salt, pepper and cider. Arrange the pork belly on top, tucking it in neatly, with the skin side up. Cook on low for 8 hours. Allow to cool and transfer the juices to a shallow, oven proof dish then place the meat snuggly on top. The evening you want to eat it, preheat the oven to 250oC. Transfer the dish to the oven and carefully slice into portions. Bake till the skin has crackled and the meat is warmed through. If the skin doesn’t crackle, transfer the meat to a heat proof plate and place under the grill. Watch it carefully and remove when crackled. It will burn easily. 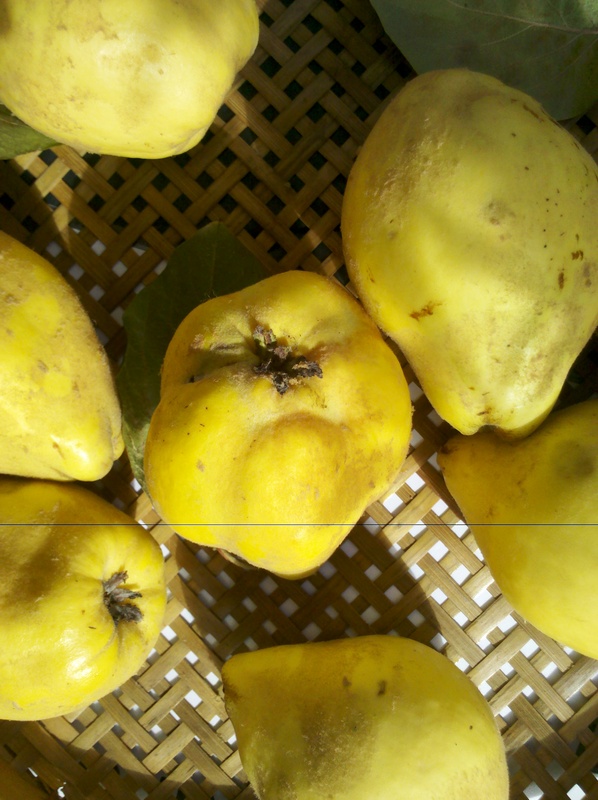 Serve meat portions with quinces and cooking liquid. I served this dish with potato galette and sautéed kale. 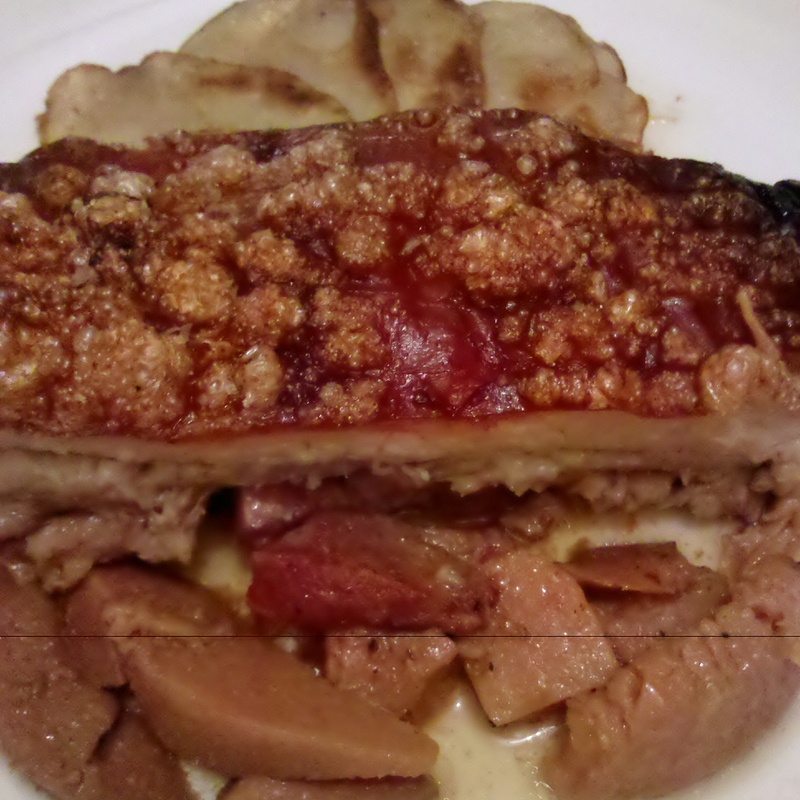 This entry was posted in Autumn, Dinner and tagged fruit, pork, slow cooked. Bookmark the permalink. That’s awesome Kim! I think it would work well with duck legs, or maybe chicken if you want them to be savoury. Otherwise, a slow braise/bake with some honey or sugar is delicious, especially if you serve them with chocolate (perhaps a rich chocolate cake or tart).